At the 67th IAA International Motor Show for commercial vehicles in Hanover, held 20- 27 September, Valeo presented two ground-breaking systems to enhance the safety of automated vehicles: Valeo Driver Monitoring and Valeo Hands On/Off Detection. As the era of the autonomous vehicles looms, safety – whether their own or that of other road users – is a key concern for the drivers of commercial vehicles. Valeo’s innovative Driver Monitoring system consists of a dash-fitted camera pointed at the driver’s face. It can identify who they are, monitor their attentiveness and quickly ensure good control of the vehicle when it switches from automated to manual driving mode. 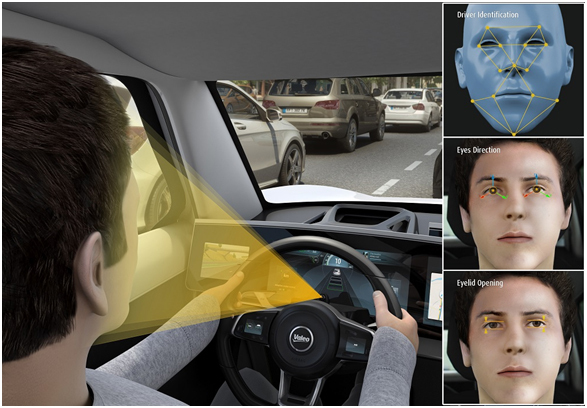 Additional software can also identify the direction of the driver’s gaze, allowing him or her to activate interfaces or context menus without even touching them. Meanwhile, the Valeo Hands On/Off Detection (HOD) system can tell if the driver’s hands are on the steering wheel or not. This information can then be safely conveyed to the driver by light-up strips on the wheel that indicate the level of automated driving.